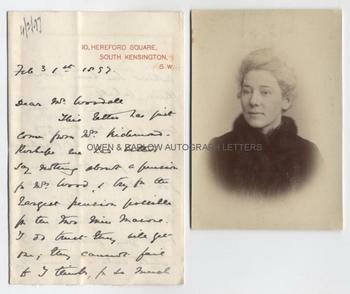 JANE COBDEN autograph letter Signed. British (Anglo-Welsh) reformer, early proponent of women's rights, the first woman elected to the inaugural London County Council, suffragist. Daughter of Richard Cobden and wife of the publisher Thomas Fisher Unwin. ALS. 3pp. 10 Hereford Square, South Kensington, SW. February 31st 1897. To [William] Woodall, MP. TOGETHER WITH a contemporary cabinet portrait photograph. 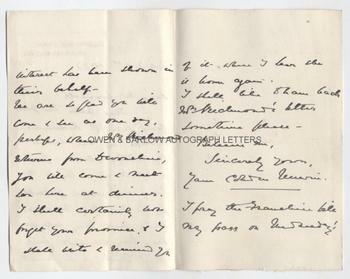 "This letter has just come from Mrs Richmond. Perhaps we had better say nothing about a pension for Mrs Wood and try for the largest pension possible for the two Miss Masons. I do trust they will get one, they cannot fail to I think, for so much interest has been shown in their behalf. We are so glad you will come and see us one day, perhaps, when Mrs Richmond returns from Devonshire, you will come and meet her here at dinner. I shall certainly not forget your promise and I will write and remind you of it when I hear she is home again. I should like to have back Mrs Richmond's letter sometime please. Believe me, Sincerely yours, Jane Cobden Unwin. I pray the Franchise Bill may pass on Wednesday." 8vo. Approx 7 x 4.5 inches. Mounting traces to blank verso of last leaf, one horizontal crease, else near fine. The portrait is an attractive 19th century cabinet photograph, showing Jane Cobden in head and shoulders vignette. It was taken when she was aged around 45. The photograph measures approx. 5.5 x 4 inches on the photographer's original pasteboard mount. There is some mounting damage to the verso, partially obliterating the photographers printed studio details but the face of the photograph is in fine condition. The three daughters of the Victorian reformer, Richard Cobden, all achieved some greatness or notoriety. Jane Cobden (who after her marriage adopted the name Jane Cobden Unwin) was perhaps foremost amongst these. She was a woman with firmly held radical Liberal views and in 1889 she stood and, to the surprise of many, won a seat on the first London County Council. Her victory was quickly opposed by the losing candidates and, following a challenge in the Courts, her election was overturned and she was not permitted to take her seat. Jane Cobden was an early and influential advocate of women's rights and women's suffrage. She formed the Women's Franchise League with Emmeline Pankhurst. She was a Cobdenite Liberal socialist and became friends with William and Jane Morris, Edward Burne-Jones and others of that set. Her sister Anne married Thomas Sanderson and her sister, Ellen, married the painter Walter Sickert. The sisters paths began to separate, however, when Anne adopted the more socialist political views of the arts and crafts movement and became involved in violent and militant protests. Ellen became a novelist after her marriage to Sickert failed. Jane Cobden continued to pursue legal and political means to achieve reforms and, after her marriage to the avant-garde publisher, Thomas Fisher Unwin, extended her political causes to rights for aboriginal peoples, home rule for Ireland, international peace and an end to the Boer War. William Woodall MP was the leader of the women's suffrage group in the House of Commons. And he introduced several private member's bills seeking the removal of voting disabilities of women, all of which failed. 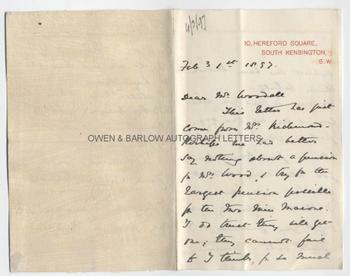 Jane Cobden is here writing to him in connection with the payment of pensions from public funds for deserving widows and children. The two miss Masons were the destitute daughters of the artist George Mason, whose plight had become something of a cause celebre to radical Liberals in the 1890s. The autograph of Jane Cobden is uncommon.